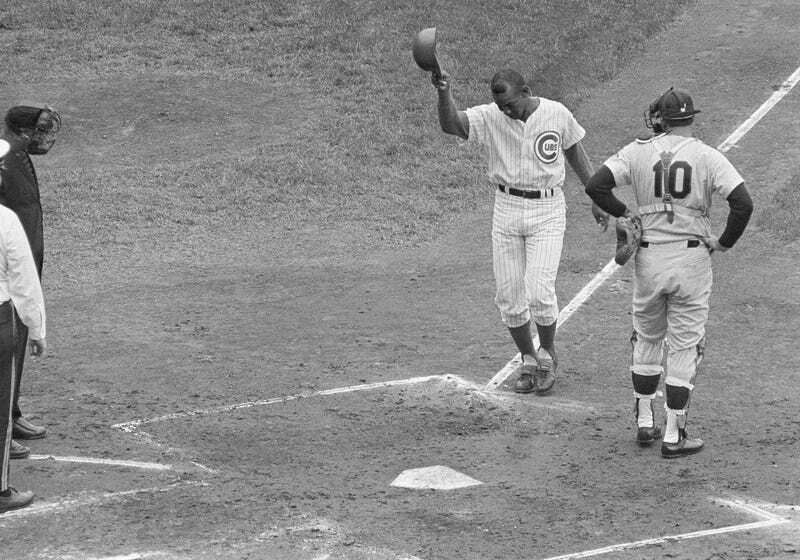 Ernie Banks, scouted by the legendary Buck O'Neill, and best known as Mr. Cub, died yesterday. We salute him with this column that John Schulian wrote for the Chicago Daily News on Aug. 5, 1977, under the headline "Mr. Cub Remembers." Ernie Banks says he doesn't mind. He is the Cubs' group sales manager and their unofficial host, and he insists that he has all he can do to take care of those jobs. But he still leaves the impression that he would love to have someone tell him the clubhouse isn't the same without him. "When I walk in there," Banks was saying Friday, "I think of where Billy Williams used to sit, and where Ron Santo used to sit, and where Glenn Beckert used to sit. It's a real emotional jolt for me." In less than twenty-four hours, Banks would be playing in the Cubs' first old-timer's game with the men who populate his happy memories and the happy memories of fans who go back four decades and more. "It's hard to believe I'm an old-timer," he said. He has already begun a campaign to make Saturday's crowd forget that he is forty-seven years old and that his final game as an active player was in 1971. On Tuesday, he jogged a mile in Wrigley Field, sweated through a set of calisthenics, and stirred a breeze by swinging a bat big enough to fell an ox. "Fifty-four inches, forty-eight ounces," he said. "They don't allow any bigger bats in professional baseball. You swing this one—just swing it—and you'll build up the muscles in your forearms." Banks followed his self-prescribed regimen until Friday. Then he pronounced himself almost ready to face live pitching for the first time since he smacked a home run in an old-timer's game in Los Angeles a year ago. What he had to do before that, though, was confer with Lew Fonseca, the attending physician for the Cubs' hitters. "Lew Fonseca told me a very important thing," Banks said. He picked up a thirty-five-inch bat bearing his name from against a file cabinet and took his stance behind his desk. "Lou Fonseca told me not to swing the way I used to. I've got to get set when the pitcher takes his sign. Hey, I tried it. It worked beautiful." So Banks had the safeguard he was looking for. While he is as courtly as he has been painted, he is also unrepentantly proud of his 512 career homers and his membership in the Hall of Fame. "I want people to remember me the way I was," he said, "not as someone who couldn't pick up a grounder or hit the ball out of the infield." It is easy to see him as a man-child who may never be able to accept a role in the world outside the white lines of a baseball diamond. After all, he was so bewildered by retirement that he almost left the Cubs organization and returned to Dallas, where he was born. But P.K. Wrigley, the team's reclusive owner, wouldn't let that happen. He stepped in and saw to the invention of a job where Banks would spend half his time hustling tickets and the other half wandering around the ballpark, charming the customers. "It shouldn't be any other way," he said. "The fans respect me and I respect them back." Dignity does not translate into stiffness where Banks is concerned. After the Cubs stymied the Mets 5-0, he told everyone who approached his office, "It was Ladies Day and we made all the ladies happy." When he discovered Dave Lamont, who occupies the desk next to his, had a prospective ticket buyer on the line from Webster, Iowa, Banks shouted, "Tell him we want all of Webster to get behind the Cubs." The office litany continued until Banks remembered something more important. "I better hang up my uniform for the old-timer's game," he said. "Don't want any wrinkles in it." He reached into a well-worn duffel bag with a peeling identification tag and pulled out his uniform. "These people in Milwaukee made it for me special," he said. "It's just like the one I wore when I broke into the big leagues in 1953." This column can be found in Schulian's essential collection Sometimes They Even Shook Your Hand; meanwhile, for the true story behind Banks' famous saying, "Let's Play Two", dig this from Glenn Stout.